The South African National Space Agency (SANSA) has been selected by the International Civil Aviation Organization (ICAO) as one of two regional centres to provide space weather services, including solar storm forecasts and warnings, to the global aviation sector. 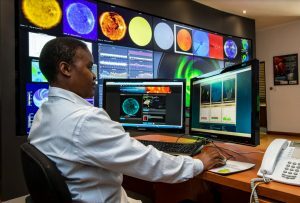 “South Africa’s designation as a regional space weather information provider will grow the science, engineering, technology and innovation sector, offering opportunities to develop scarce skills and increase national research output, while ensuring that usable products and services are generated for the safety of the nation,” said Minister of Science and Technology, Mmamoloko Kubayi-Ngubane. Space weather describes events that happen in space, which can disrupt modern technologies such as satellites, GPS, power grids, navigation and communication systems. Owing to the increased interconnectedness and interdependence of technological systems in the world today – which will expand as the Fourth Industrial Revolution gathers momentum – space weather events can have a negative impact on multiple systems. These can lead to serious operational failures in the communication, navigation, energy and aviation sectors, among others, with potentially disastrous effects. The impact doesn’t end there as space weather can have a major knock-on effect on airline companies and airports. ICAO has recognised the need for the adoption of procedures related to mitigating space weather impacts for flight safety. ICAO recommended that all aviation providers and users become familiar with the impacts of space weather on the aviation sector and requested that pertinent space weather information be filed with all flight plans in the near future. “The international community has supported South Africa’s ICAO designation, and has demonstrated confidence in SANSA’s ability to provide the services required. The process that SANSA underwent to achieve this designation has already enhanced South Africa’s reputation in the space science and technology field,” said Minister Kubayi-Ngubane. SANSA, an entity of the Department of Science and Technology, underwent an extensive assessment to earn the accreditation to become one of two ICAO-designated regional space weather centres. The final selection process took place at a recent ICAO Council meeting where the decision was taken to appoint 3 global centres and 2 regional centres. The global centres (USA, Pan-European Consortium PECASUS, and the Australia, Canada, France and Japan Consortium) have begun to deliver on the requirements, while the regional centres (South Africa and a joint centre by Russia and China) will have until 2022 to build the necessary capability to provide the required services. SANSA will partner with one of ICAO’s three global space weather centres, PECASUS, the Pan-European Consortium for Aviation Space Weather User Services, to provide ICAO with space weather information for the African region. PECASUS is a consortium of nine European countries, and partnering with it will provide South Africa with better access to international models and expertise. The Space Agency has been developing space weather services over the past nine years, and currently operates a space weather centre at the facility in Hermanus. This centre was recently upgraded and unveiled by the Honourable Minister of Science and Technology, Mrs Mmamoloko Kubayi-Ngubane. “SANSA’s monitoring of the sun and its activity has been providing the country with vital early warnings and forecasts on space weather conditions, and these benefits will now be extended to the international aviation community,” said Minister Kubayi-Ngubane. Over the next few years SANSA will be working closely with the Air Traffic Navigation Service (ATNS), the South African Weather Service (SAWS), and the Civil Aviation Authority and other applicable aviation partners to investigate the implications of the ICAO recommendation to the African aviation sector. “We need to ensure the aviation industry understands the risks related to space weather, what to look out for and what to expect. SANSA will provide the necessary information to enable key decision makers to make informed decisions,” says Dr McKinnell. The aviation sector (both commercial and private) are required to comply with the ICAO amendments, and having access to information and expertise locally will ensure South Africa is able to meet the requirements. While South Africa is the only African country with operational space weather capabilities, SANSA with the support of the DST, will engage with other African countries on data sharing, infrastructure hosting, training, product development, and research collaboration opportunities. T-Index predictions: the ionospheric index that indicates the highest frequencies that will be reflected, a critical input for HF propagation software and communications planning. Daily and weekly HF prediction graphs for different signal paths, special frequency prediction and plots of signal-to-noise ratios, take-off angles and maximum useable frequencies versus time. Space weather warnings and alerts. The Space Weather Centre also presents training courses addressing the impact of space weather on HF communications and trains users on how to generate frequency predictions themselves.